'Pink Bubbles' ( Ben Hager, R. 1979). Seedling #BB3201Pk. BB, 20" (51 cm). Early midseason bloom. Clear light pink self; pale tangerine beard. 'Pink Pirouette' X 'Vanity'. Melrose Gardens 1980. 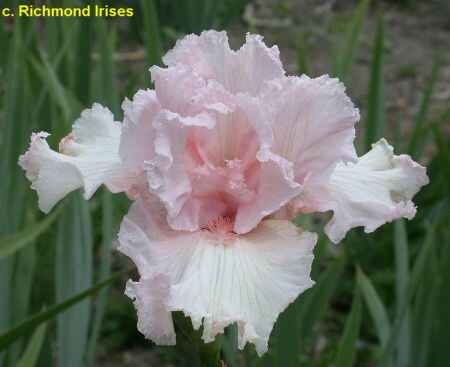 Honorable Mention 1982; Award of Merit 1984; Knowlton Medal 1986.
jpg PinkBubbles4.jpg manage 382 K 09 Oct 2018 - 03:04 Main.TLaurin Photo by Sunshine Iris Nursery-Australia. JPG pinbubbles02.JPG manage 102 K 08 Jun 2014 - 03:24 Main.TLaurin Photo by Don McQueen,London, Ont. Canada Zone5. jpg pinkbubbles4.jpg manage 36 K 04 Dec 2018 - 16:25 Main.TLaurin Photo by Iriszkert Szasz-Hungary.